In 2013 there was a spectacular discovery in the Sierra Nevada of a trove of 19th-century gold coins worth millions of dollars. My own numismatic adventures are at the opposite end of the value spectrum. 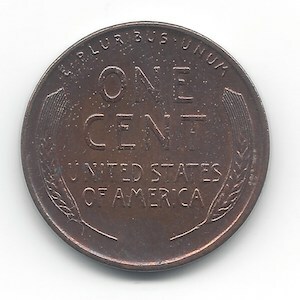 When we were in school in the early 1960s, one of my brothers and I began collecting the coins we found in circulation. We found a few Indian Head pennies, which were minted from the 1800s through the early 1900s. The Lincoln Head coin, minted beginning in 1909, the centenary of Lincoln's birth, is still minted today. The major design changes over the years have been on the reverse side. The Wheat Stalk graced the reverse through 1958, and the Lincoln Memorial appeared there from 1959 through 2008. We also found a few steel 1943 pennies. The penny dates to the first millenium AD in Britain and France. Some of the earliest ones were made of silver. 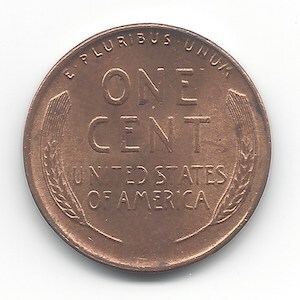 On this side of the Atlantic, the copper penny dates to the founding our of nation. Little did my brother and I know that the humble copper penny would one day become modestly valuable. For most of its history the coin was a brass alloy of 5% zinc or a bronze alloy of 5% tin and zinc. The latter are base metals, but copper has special properties favored by makers of electrical products and equipment. Due to a rise in the price of copper, the mint switched in 1982 to a zinc disk with a thin copper coating. As I write, copper is selling for about $3.16 per pound on the Commodity Exchange (COMEX). That comes to about 2.1 cents worth of metal in each pre-1982 coin. The zinc penny doesn't withstand abuse as well as its predecessor. The thin copper coating is easily punctured or damaged, and the zinc beneath it is quite a bit softer than copper. This makes the coin the numismatic equivalent of an ice cream sandwich. You get what you pay for. As a youth, I was able to see most of the details on a coin without a magnifying glass or special lighting. Taking up the hobby again more than fifty years later, I discovered that unaided I can no longer see the coins as well as I once did. My eye doctor suggested getting a pair of 3x reading glasses, which have worked well. A coin's surface is three-dimensional, or at least two-and-a-half dimensional, and its value depends largely on the clarity and definition of the relief. The other major factor in determining price is scarcity. So it's really about the attractiveness of the piece and the market demand. On the East Coast, coins minted in Philadelphia were plentiful, those minted in Denver were less so, and San Francisco minted coins were the hardest to find. Here in California, coins from each of the three mints are present in about equal quantities for the years prior to 1975, when the San Francisco mint was still producing coins for general circulation. Among the pennies minted since then, the vast majority in circulation here are from Denver and the rest are from Philadelphia. It turns out that in 2014 about one of every six pennies I saw in circulation was made of the pre-1982 copper alloy, and the rest were of the more recent zinc composition. Another feature to look for is the Wheat Stalk reverse found on Lincoln Head pennies minted in 1958 and before. About one in every three hundred coins has this reverse. They're worth a few cents each in bulk, more for the rarer dates and for those that are in unusually well-preserved condition. I was able to find at least one copy of each Lincoln Head minted after World War II, a period of seventy years. The oldest coins I've found are from the late teens and early 1920s. Most of these are only in fair condition; they're quite worn and barely collectible. The oldest coins in very fine condition, a desirable grade for collectors, are from the mid to late 1930s. In recent history, the humble penny has never been made of a precious metal like silver or gold. The phrase "pennies from heaven" is a commoner's benediction, and penny loafers are known for their informality and unpretentiousness. 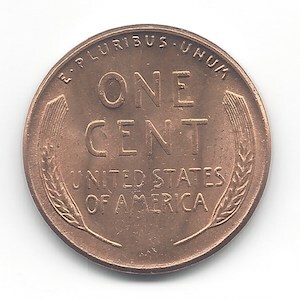 "Penny ante," "penny stock," and "penny wise, pound foolish," however, are pejorative phrases aimed at the innocent one-cent piece, and we are meant to take the saying, "a penny for your thoughts" ironically. Sometimes we even use the penny as a weapon, such as when we pay a contested bill entirely in pennies. But people don't even use physical currency much any more. When we do receive pennies from the cashier, we don't know what to do with them. Most vending machines don't take them. Penny candy became history long ago. To relieve ourselves of their burden, we put them along with other coins in the tips jar, or we give them to homeless people, or take them to the coin cashing machines. Some businesses, such as farmers markets and food co-ops, accept no denomination less than the five-cent piece. Despite these challenges, however, the penny is still with us. Don't get any ideas about melting down your copper pennies for profit. It's illegal to destroy US currency or to move large quanties of it abroad. As a rule, copper pennies, like other coins, are worth more to collecters than their meltdown value. This is likely to remain so. The Canadian mint ceased the production and distribution of the cent in 2012 and 2013, respectively. It's just a matter of time before the US retires its cent and it becomes the exclusive domain of coin collectors. You know those guys who walk on the beach with metal detectors and funny-looking headphones? They're actually just taking a healthful walk in the sea air, so God bless them. It's always possible, however, that they'll find something. Looking through your pocket change is unlikely to result in the kind of life-changing event the folks in the Sierra Nevada enjoyed. But you never know, maybe some day one of those coins will be worth a pretty penny.